Introduction Vitamin D deficiency has been associated with many chronic illnesses, but little is known about its relationship with chronic obstructive pulmonary disease (COPD). Objectives Serum 25-hydroxyvitamin D (25-OHD) levels were measured in 414 (ex)-smokers older than 50 years and the link between vitamin D status and presence of COPD was assessed. The rs7041 and rs4588 variants in the vitamin D-binding gene (GC) were genotyped and their effects on 25-OHD levels were tested. Results In patients with COPD, 25-OHD levels correlated significantly with forced expiratory volume in 1 s (FEV1) (r=0.28, p<0.0001). Compared with 31% of the smokers with normal lung function, as many as 60% and 77% of patients with GOLD (Global Initiative for Obstructive Lung Disease) stage 3 and 4 exhibited deficient 25-OHD levels <20 ng/ml (p<0.0001). Additionally, 25-OHD levels were reduced by 25% in homozygous carriers of the rs7041 at-risk T allele (p<0.0001). This correlation was found to be independent of COPD severity, smoking history, age, gender, body mass index, corticosteroid intake, seasonal variation and rs4588 (p<0.0001). Notably, 76% and 100% of patients with GOLD stage 3 and 4 homozygous for the rs7041 T allele exhibited 25-OHD levels <20 ng/ml. Logistic regression corrected for age, gender and smoking history further revealed that homozygous carriers of the rs7041 T allele exhibited an increased risk for COPD (OR 2.11; 95% CI 1.20 to 3.71; p=0.009). Conclusion Vitamin D deficiency occurs frequently in COPD and correlates with severity of COPD. The data warrant vitamin D supplementation in patients with severe COPD, especially in those carrying at-risk rs7041 variants. As patients with COPD mostly exhibit increased skin ageing induced by smoking and reduced sun exposure due to less outdoor activity, reductions in vitamin D serum levels are generally perceived as a consequence, rather than a cause, of COPD.4 Intriguingly, however, epidemiological studies in healthy subjects have reported a strong relationship between 25-OHD serum levels and pulmonary function, as assessed by forced expiratory volume in 1 s (FEV1) and forced vital capacity (FVC).12 This suggests that vitamin D levels are not only reduced as a consequence of COPD, but might also be important for pulmonary function in health and disease.13 Interestingly, genetic variants in the vitamin D-binding gene (GC) have also been linked to COPD risk.14–17 However, these studies have remained somewhat controversial, mostly because only small COPD populations consisting of <100 patients with COPD were examined and associations were not always replicated.14–17 Recently, the rs7041 and rs4588 variants were found to determine circulating 25-OHD levels in 741 healthy premenopausal women, with decreasing concentrations for the less frequent alleles of the rs7041 and rs4588 variants.18 Whereas seasonal variation was the most important explanatory variable of 25-OHD concentrations in this study, rs7041 and rs4588 explained 25-OHD variation as much as vitamin D food intake, calcium intake and body mass index (BMI),19 thus indicating that their effect was considerably large and important. In light of the emerging role of vitamin D deficiency in chronic disease and the novel insights into the functional effect of rs7041 and rs4588, we measured 25-OHD serum levels in an ambulatory population of 414 individuals not taking vitamin D supplements, consisting of patients with COPD and healthy control subjects of similar age, gender distribution and smoking history. We first analysed whether 25-OHD levels correlated with COPD and the severity thereof, and then performed a joint analysis of the rs7041 and rs4588 genotypes, 25-OHD serum levels and the risk of COPD. All 414 individuals were prospectively recruited at the University Hospital of Leuven (Belgium). Inclusion criteria were the following: a smoking history of at least 15 pack-years, a minimal age of 50 years and no oral supplementation with vitamin D. Patients with symptomatic COPD were recruited during their routine follow-up at the outpatient clinic in stable clinical condition, which means that they were receiving stable treatment and had no exacerbation 6 weeks before inclusion in the study. Smoking controls with normal spirometry (postbronchodilator FEV1/FVC ratio ≥0.7) as well as patients with early non-diagnosed COPD (postbronchodilator FEV1/FVC ratio <0.7) were participants in the Dutch–Belgian randomised lung cancer screening trial (NELSON).20 In this trial, participants who were recruited via population registries were invited to participate by mail. Only NELSON individuals recruited by the University Hospital of Leuven, and therefore derived from the same geographical and ethnical region as the patients with COPD, were included in this study. Subjects with suspicion or diagnosis of asthma were excluded, as were patients with other respiratory diseases affecting pulmonary function. From all consenting patients an extensive list of demographic variables (including age, gender, BMI in kg/m2), a complete pulmonary function assessment and questionnaires determining smoking history was collected. The study was approved by the local ethics committee (Leuven, Belgium) and submitted to www.clinicaltrials.gov. Serum total 25-OHD was measured in multiple batches by radioimmunoassay (DiaSorin, Stillwater, Minnesota, USA) in all study participants, as previously described.24 All 25-OHD samples were measured in one laboratory, which takes part in, and meets the performance targets for the vitamin D external quality assessment scheme (DEQAS).25 Total 25-OHD measures are mean values of duplicate measures referred to appropriate positive controls. Levels are expressed in ng/ml (conversion factor 2.5 for nmol/l) and reflect the vitamin D status, as represented by the non-vertebral vitamin D2 and vertebral vitamin D3 status. Peripheral blood was sampled in K2EDTA plastic vacutainer tubes and, after centrifugation, germline DNA was extracted from the precipitated leucocyte cell fraction according to standard procedures. Germline DNA was obtained from 404 out of 414 patients (97%). All patients were of Caucasian origin and self-reported Belgian–Flemish origin for three generations. Genotyping for the rs7041 and rs4588 single nucleotide polymorphism (SNP) genetic variants was carried out at the Vesalius Research Institute using the Sequenom iPLEX platform, as described by the manufacturer (Sequenom, San Diego, California, USA). Genotype success rates for the rs7041 and rs4588 SNPs were 99.8%. No significant deviations from Hardy–Weinberg equilibrium were observed. All statistical analyses were performed by SAS version 9.1 (SAS Institute, Cary, North Carolina, USA). For all tests, two-sided p levels <0.05 were considered as statistically significant. Demographic, pulmonary function and smoking characteristics in patients with COPD and healthy controls were first assessed for normal distribution (Shapiro–Wilk normality test) and, depending on their distribution, compared by standardised Student t test or Pearson χ2 test. Non-parametric data such as pack-years, years since quitting smoking and age were analysed by Wilcoxon statistics. Differences in mean 25-OHD levels between patients with COPD and controls over the different GOLD stages and between GC genotypes were assessed by analysis of variance (ANOVA) after correction for testing multiple subgroups by the Tukey–Kramer posthoc test. To assess determinants of serum 25-OHD in the COPD and healthy subgroups, a stepwise multivariate analysis was performed with FEV1 and KCO % predicted, age (log transformed) and BMI as continuous variables, and seasonal variation, gender, previous and current use of oral corticosteroids, current smoking status, rs7041 and rs4588 as categorical variables. Pack-years were calculated as the number of years a patient had smoked 20 cigarettes per day. Quit-years were the number of years since a patient stopped smoking. Previous use of oral corticosteroids 3 months before inclusion, as well as current use of oral corticosteroids in maintenance treatment was noted. Season of blood sampling was categorised into three 4-month periods during which the vitamin D load by sun exposure is known to range from low (December–March), to intermediate (April, May, October and November) to high (June–September). The Pearson χ2 test (1 degree of freedom (1 df)) was also used to test for deviations from Hardy–Weinberg equilibrium. Linkage disequilibrium strength was evaluated with r and the Lewontin D' statistic between rs7041 and rs4588. To test the association between rs7041 and rs4588 allelic variants and COPD, a standard χ2 test (1 df) was used. Logistic regression analysis with COPD as a response variable was used, while considering rs7041 as a dependent variable and correcting for age, gender, pack-years, quit-years and 25-OHD concentrations. In total, 414 individuals were included. All baseline characteristics of these individuals are summarised in table 1. Two hundred and sixty-two patients had COPD according to GOLD criteria; 152 individuals had a normal postbronchodilator pulmonary function and were considered as controls. Both groups exhibited a similar gender distribution and an equal percentage of current smokers. However, patients with COPD were slightly older and were characterised by an increased number of pack-years (p<0.001; table 1). Circulating 25-OHD serum levels were found to correlate significantly with FEV1 in the COPD subgroup (Pearson r=0.28, p<0.0001; figure 1a). There was no correlation with FEV1 in the subgroup of healthy smokers. Mean 25-OHD levels also differed significantly between patients with COPD and healthy smokers (19.9±8.2 ng/ml in patients with COPD vs 24.6±8.7 ng/ml in healthy smokers; p<0.0001). Although the mean 25-OHD levels in GOLD 1 (22.4 ng/ml) were not significantly different from those of the control population, average 25-OHD levels further decreased with increasing GOLD stage. Indeed, from GOLD 2 onwards, 25-OHD levels differed significantly from those of healthy smokers (20.35, 18.8 and 16.0 ng/ml for GOLD 2, 3 and 4, respectively; p<0.0001; figure 1b). Mean 25-OHD levels were almost 33% lower in patients with COPD with GOLD 4 compared with healthy smokers (figure 1b). (a) 25-Hydroxyvitamin D (25-OHD) serum levels plotted as a function of the forced expiratory volume in 1 s (FEV1) levels (% predicted FEV1 was used). The Pearson coefficient of determination was calculated as indicated. (b) Plot showing 25-OHD levels according to the various GOLD (lobal Initiative for Obstructive Lung Disease) stages. An analysis of variance (ANOVA) univariate test followed by a Tukey–Kramer posthoc test for testing multiple groups was used to calculate significances. Asterisks indicate p<0.0001. (c) Percentage of patients having 25-OHD levels >30 ng/ml (white), serum levels between 30 and 20 ng/ml (grey), and deficient serum levels <20 ng/ml (black). Stratification of all 414 participants into the three subgroups—that is, participants deficient for vitamin D (<20 ng/ml), participants with 25-OHD levels between 20 and 30 ng/ml and participants with 25-OHD levels >30 ng/ml—revealed that only 31% of the healthy smokers exhibited vitamin D deficiency, whereas 39, 47 and 60%, respectively, of the patients with GOLD stage 1, 2 and 3, and as many as 77% of GOLD stage 4 patients were deficient for vitamin D (figure 1c). In addition, only 2.0% of the healthy controls compared with 4.3, 8.1, 8.0 and 13.3%, respectively, of the patients with a GOLD stage ranging from 1 to 4 were severely vitamin D deficient (<10 ng/ml). Overall, these data clearly indicate that reduced 25-OHD levels are correlated with severity of COPD. Since two genetic variants in GC—that is, rs7041 and rs4588—have been associated with 25-OHD levels in premenopausal women, we genotyped all study participants for both variants and stratified for COPD. In patients with COPD, TT carriers for rs7041 and AA carriers for rs4588 were associated with significantly lower 25-OHD serum concentrations compared with homozygous carriers of the wild-type alleles (p<0.0001 and p=0.01, respectively; table 2). Intermediate reductions in 25-OHD were noted for heterozygous carriers of the rs7041 allele and the rs4588 allele, but these did not reach the level of significance. In the control population, similar trends were seen, with a significant reduction in 25-OHD levels detectable in rs7041 TT carriers when compared with wild-type GG carriers (p=0.03; table 2). Since many environmental and disease-associated factors may determine vitamin D status in healthy smokers or patients with COPD, we used a stepwise multivariate analysis to assess whether rs7041 and rs4588 variants were independently associated with 25-OHD levels. We first assessed the effect of rs7041 and rs4588 in separate multivariate analyses. In the healthy smokers subgroup, both rs7041 and rs4588 were associated with 25-OHD when correcting for age, gender, current smoking status, BMI and seasonal variation (p=0.02 and p=0.03; data not shown). A similar analysis in the subgroup of patients with COPD revealed that rs7041 and rs4588 were also associated with 25-OHD concentrations (p=0.0001 and p=0.05; data not shown) after correction for age, gender, smoking status, BMI, seasonal variation, previous and current oral corticosteroid use, and severity of disease (both FEV1 and KCO expressed as % predicted). We then combined rs7041 and rs4588 in a single multivariate model and assessed whether their effects were independent from each other. In the COPD subgroup, rs7041 was still significantly associated with 25-OHD levels (p<0.0001; table 3), but the association between rs4588 and 25-OHD had disappeared. This is most probably due the fact that the linkage disequilibrium between rs7041 and s4588 is almost complete (D'=1.00, r2=0.74). The rs4588 variant thus contributes the same information to the multivariate model as the rs7041 variant. The latter can therefore be regarded as the major variant predicting 25-OHD levels. 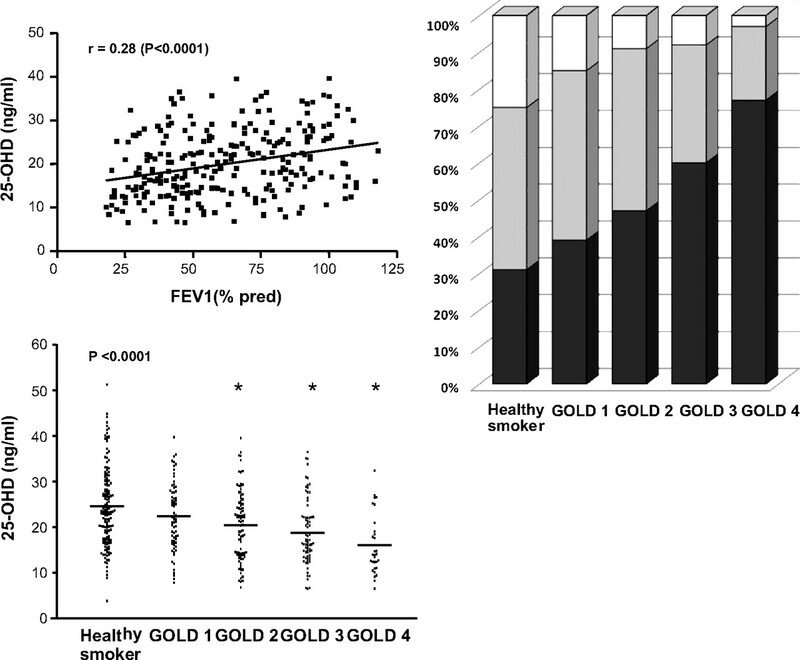 Since FEV1 and the rs7041 variant were both independent predictors of reduced 25-OHD levels in patients with COPD, we also related 25-OHD levels to the rs7041 variant after stratification for GOLD severity. TT carriers of rs7041 with COPD were at a higher risk of being vitamin D deficient compared with GG and GT carriers (41/60 vs 94/193; p=0.008). Mean 25-OHD levels in TT carriers for rs7041 decreased significantly with increasing GOLD stage: 19.5±7.2, 17.9±7.9, 15.3±6.4 and 10.9±2.7 ng/ml for GOLD stage 1, 2, 3 and 4, respectively (p=0.03). Strikingly, in GOLD stage 3–4, as many as 73% and 100% of the homozygous carriers were found to be vitamin D deficient (data not shown). Since 25-OHD levels are reduced in patients with COPD and since the rs7041 variant determined 25-OHD levels independently of COPD severity, we assessed whether rs7041 may also constitute a genetic risk for COPD. Homozygosity for the rs7041 T allele increased the risk for COPD significantly in a χ2 analysis (23/150 vs 60/253; p=0.04). A logistic regression analysis correcting for age, gender and history of smoking also revealed that homozygous carriers of the rs7041 T allele exhibited a significantly increased risk for COPD (OR 2.11; 95% CI 1.20 to 3.71; p=0.009; table 4). Heterozygous carriers of a single at-risk rs7041 T allele did not exhibit an increased risk, which is consistent with the much weaker association of heterozygous rs7041 carriers with reduced 25-OHD levels. In agreement with the observation that rs4588 was not an independent determinant of 25-OHD levels, there was also no association with the rs4588 variant and the risk for COPD (data not shown). Intriguingly, when correcting the logistic regression model for 25-OHD levels, homozygosity for the rs7041 risk variant was also no longer a significant predictor of COPD. Furthermore, logistic regression allowing for an interaction between rs7041 and pack-years, years of smoking, quit-years, BMI and seasonal variation failed to reveal any significant interaction (not shown). Overall, this suggests that the rs7041 variant, through its association with reduced 25-OHD levels, was correlated with the presence of COPD. This study demonstrates that vitamin D deficiency, as assessed by 25-OHD levels in serum, is common in patients with COPD and correlates with the severity of disease as measured by FEV1. In a large cohort, we show that patients with COPD are more likely to suffer from vitamin D deficiency than matched healthy smokers. Indeed, a non-significant trend towards reduced 25-OHD levels was already apparent in GOLD 1, and 25-OHD levels further decreased significantly from GOLD 2 onwards, resulting in vitamin D deficiency in the majority of patients with severe COPD. Comparable results were found in a population-based study—the third National Health and Nutrition Examination Survey (NHANES; cross-sectional survey on 14 091 healthy US civilians >20 years of age).12 After adjustment for potential confounders, a strong relationship between serum levels of 25-OHD and pulmonary function, as assessed by FEV1 and FVC, was found in this study. Although the authors did not report a significant correlation with COPD, the association between FEV1 and 25-OHD levels tended to be slightly stronger in the smoking subgroup. Our current data therefore extend the population-based association between FEV1 and 25-OHD levels from NHANES to a cohort of patients with COPD and, most importantly, establish that a significant subgroup of patients with COPD is deficient for vitamin D.
Although there is no consensus regarding the optimal 25-OHD serum levels, vitamin D deficiency is defined by most experts as a 25-OHD level <20 ng/ml. Levels below this threshold are experienced by the parathyroids as being insufficient.26 Since vitamin D deficiency increases the risk for osteoporosis and osteoporotic fractures, vitamin D supplementation, at least to levels >20 ng/ml, should be strongly considered for all patients suffering from vitamin D deficiency in order to prevent osteoporosis.27 As patients in GOLD stages 3 and 4 were vitamin D deficient in >60–77% of cases, standard vitamin D supplementation without routine measurement of 25-OHD levels might be considered appropriate in these patients. When vitamin D supplementation is also being considered for its beneficial anti-inflammatory, anti-infectious and muscle-enforcing effects,3 28 29 one would have to speculate about the ideal target range of 25-OHD levels. Several experts have suggested that much higher levels than 20 ng/ml might be needed.30 If this is true, the vast majority of our patients would then become candidates for intervention. Vitamin D status measured by circulating 25-OHD reflects the dynamic equilibrium between vitamin D synthesis in the skin by sun exposure, vitamin D intake via food or dietary supplements and vitamin D degradation by catabolising enzymes. Up to 99% of 25-OHD is bound to plasma proteins, of which >90% is bound to the specific vitamin D-binding protein (DBP).31 Patients with COPD can be considered at high risk for vitamin D deficiency because they are more prone to skin ageing (due to smoking), are involved in reduced outdoor activity, exhibit reduced food intake, and are often treated with corticosteroids, which increases vitamin D catabolism.3 As such, vitamin D deficiency should be regarded as the consequence of COPD, and more severe types of COPD would be expected to result in more severe reductions in vitamin D. Multivariate analysis in our COPD group indeed demonstrated that 25-OHD levels are determined not only by oral substitution, seasonal variation and BMI, but also by FEV1 and diffusion capacity, which reflect the severity and duration of the disease. However, after adjustment for FEV1 and diffusion capacity, we found that genetic variants in GC still correlated significantly with 25-OHD levels. Similar associations have recently been shown in premenopausal women, in which the rs7041 and rs4588 polymorphisms were associated with reduced 25-OHD levels after correction for leisure time physical activity (as a surrogate for sun exposure), calcium/vitamin D intake and education.18 Compared with premenopausal and postmenopausal women,18 32 our study predominantly evaluated men of older age, whose 25-OHD levels were far more reduced, indicating that the observed association was population independent. Overall, this indicates that patients with COPD, especially those who carry two T alleles of the rs7041 variant, were at high risk for vitamin D deficiency. An important question is whether oral vitamin D supplementation will work for patients with such a genetic defect in GC. A recent study revealed that vitamin D supplementation in homozygous carriers of the rs4588 A allele, which are in near complete linkage with the at-risk T allele of rs7041, resulted in large increases of 25-OHD levels.33 These data suggest that TT carriers of the rs7041 variant are indeed sensitive to vitamin D supplementation. Epidemiological and mechanistic evidence in humans indicates that vitamin D deficiency is associated with many chronic diseases, such as cardiovascular disease, autoimmune disease, cancer and chronic infections.1 3 Many of these diseases are also considered to be co-morbidities of COPD. Possibly, chronically reduced 25-OHD serum levels in patients with COPD may negatively affect these co-morbidities, once COPD is established, thereby promoting disease progression.4 However, evidence also indicates that vitamin D may causally contribute to different chronic disorders.34 35 Moreover, given the population-based association between vitamin D deficiency and incidence of upper respiratory tract infections in healthy individuals,36 and given its association with asthma severity in childhood,37 it is tempting also to consider vitamin D deficiency as a risk factor for COPD by dysregulation of adaptive and innate immunity. In our sample we found that the percentage of patients carrying two at-risk rs7041 alleles significantly increased from 15% in the control group to 24% in patients with COPD. The association between the risk rs7041 alleles and COPD was more pronounced after adjustment for others risk factors of COPD. When corrected for 25-OHD levels, however, it was no longer significant, suggesting that the risk effect of rs7041 was determined by reduced 25-OHD levels. Our population is a homogeneous selected patient cohort, which limits the general applicability of the data. Genetic replication studies, involving genome-wide analyses and population-based sample cohorts, are needed to confirm the association of rs7041 with the risk for COPD.38–40 Furthermore, since the observed association between GC genetic variants and COPD does not prove causality between vitamin D deficiency and COPD, population-based prospective follow-up studies39 and placebo-controlled intervention studies,4 which are properly designed to do so, should be conducted. Obviously, it is important to assess this, since vitamin D supplementation could represent an attractive therapeutic option to prevent disease progression, well before the consequences of COPD and ageing further reduce 25-OHD levels. The authors acknowledge Kristien Debent and Geert Celis for collecting data and blood samples, Natacha Lays and Gilian Peuteman for technical assistance and genotyping of the genetic variants, and Hans Scheers for his statistical advice.
. Vitamin D and health: perspectives from mice and man. J Bone Miner Res 2008;23:974–9.
. Vitamin D assessment in population-based studies: a review of the issues. Am J Clin Nutr 2008;87:1102S–5S.
. Prevalence and determinants of vitamin D deficiency in COPD outpatients. Eur Respir J Suppl 2008;P3374.
. Prevalence of vitamin D insufficiency in an adult normal population. Osteoporos Int 1997;7:439–43.
. 13th Workshop consensus for vitamin D nutritional guidelines. J Steroid Biochem Mol Biol 2007;103:204–5.
. Estimates of optimal vitamin D status. Osteoporos Int 2005;16:713–16.
. Association of Gc-globulin variation with susceptibility to COPD and diffuse panbronchiolitis. Eur Respir J 2001;18:753–7.
. Risk and severity of COPD is associated with the group-specific component of serum globulin 1F allele. Chest 2004;125:63–70.
. Genetic markers in chronic air-flow limitation. A genetic epidemiologic study. Am Rev Respir Dis 1983;127:263–9.
. Vitamin D binding protein variants and the risk of COPD. Am J Respir Crit Care Med 1998;157:957–61.
. Genetic polymorphisms of the vitamin D binding protein and plasma concentrations of 25-hydroxyvitamin D in premenopausal women. Am J Clin Nutr 2009;89:634–40.
. Group-specific component (Gc) proteins bind vitamin D and 25-hydroxyvitamin D. Proc Natl Acad Sci USA 1975;72:2076–80.
. Lung volumes and forced ventilatory flows. Report of the Working Party Standardization of Lung Function Tests, European Community for Steel and Coal. Official Statement of the European Respiratory Society. Eur Respir J Suppl 1993;16:5–40.
. Global strategy for the diagnosis, management, and prevention of chronic obstructive pulmonary disease: GOLD executive summary. Am J Respir Crit Care Med 2007;176:532–55.
. The 1995 update of recommendations for a standard technique for measuring the single-breath carbon monoxide diffusing capacity (transfer factor). Am J Respir Crit Care Med 1996;154:265–6.
. Two direct (nonchromatographic) assays for 25-hydroxyvitamin D. Clin Chem 1984;30:1731–6.
. Measurement of vitamin D metabolites: an international perspective on methodology and clinical interpretation. J Steroid Biochem Mol Biol 2004;89–90:467–71.
. Vitamin D deficiency and secondary hyperparathyroidism in the elderly: consequences for bone loss and fractures and therapeutic implications. Endocr Rev 2001;22:477–501.
. Need for additional calcium to reduce the risk of hip fracture with vitamin d supplementation: evidence from a comparative metaanalysis of randomized controlled trials. J Clin Endocrinol Metab 2007;92:1415–23.
. Higher 25-hydroxyvitamin D concentrations are associated with better lower-extremity function in both active and inactive persons aged > or =60 y. Am J Clin Nutr 2004;80:752–8.
. Seasonality of tuberculosis: the reverse of other respiratory diseases in the UK. Thorax 1996;51:944–6.
. Vitamin D toxicity, policy, and science. J Bone Miner Res 2007;22:64–68.
. Biological and clinical aspects of the vitamin D binding protein (Gc-globulin) and its polymorphism. Clin Chim Acta 2006;372:33–42.
. Plasma concentrations of 25-hydroxy-vitamin D and 1,25-dihydroxy-vitamin D are related to the phenotype of Gc (vitamin D-binding protein): a cross-sectional study on 595 early postmenopausal women. Calcif Tissue Int 2005;77:15–22.
. Common genetic variants of the vitamin D binding protein (DBP) predict differences in response of serum 25-hydroxyvitamin D [25(OH)D] to vitamin D supplementation. Clin Biochem 2009;42:1174–7.
. Vitamin D and calcium supplementation reduces cancer risk: results of a randomized trial. Am J Clin Nutr 2007;85:1586–91.
. Association between serum 25-hydroxyvitamin D level and upper respiratory tract infection in the Third National Health and Nutrition Examination Survey. Arch Intern Med 2009;169:384–90.
. Serum vitamin D levels and markers of severity of childhood asthma in Costa Rica. Am J Respir Crit Care Med 2009;179:765–71.
. The new genetics and chronic obstructive pulmonary disease. COPD 2008;5:257–64.
. What can naturally occurring mutations tell us about the pathogenesis of COPD? Thorax 2009;64:359–64. Ethics approval This study was conducted with the approval of the Local Ethics Committee of the University Hospital Leuven. Is vitamin D deficiency important in the natural history of COPD?